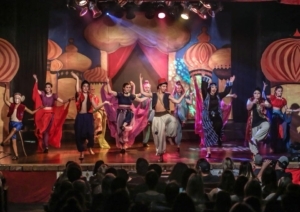 As the curtain closed on the Branson Regional Arts Council’s Youth Troupe production of Aladdin Jr. last week, 43 young area actors received an enthusiastic standing ovation from the appreciative audience. Two and a half weeks of preparation, six public performances, and six standing ovations left these kids feeling proud of their accomplishments. 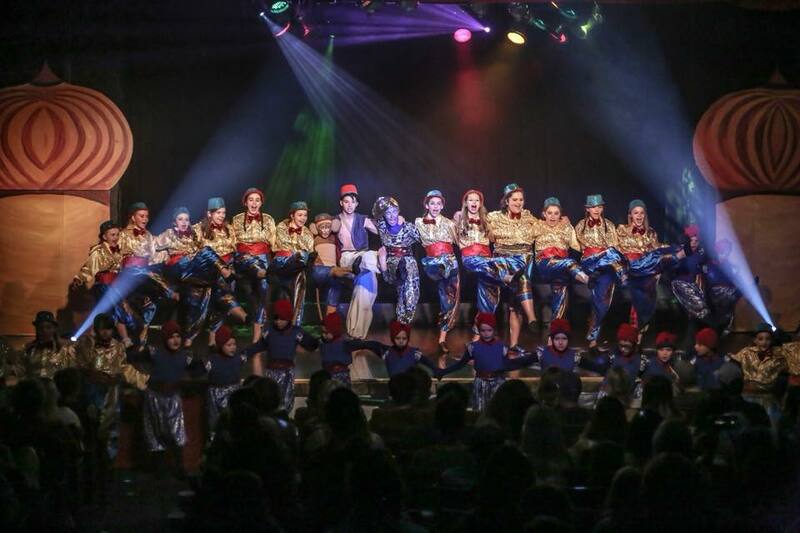 Their parents were equally proud of the effort, dedication, and courage that their children put forth as part of this exciting musical production. During the final performance, emotions were high as the kids experienced joy for what they had accomplished, as well as sadness that their 3 week theatrical adventure had come to an end. They all have one thing in common, however, their lives have been positively influenced by the opportunity to learn and grow their confidence and performing skills through their participation in the Youth Troupe Institute program. Disney’s Aladdin Jr. was the first of two Youth Troupe Institute programs this year, specifically designed for students age 6-18. 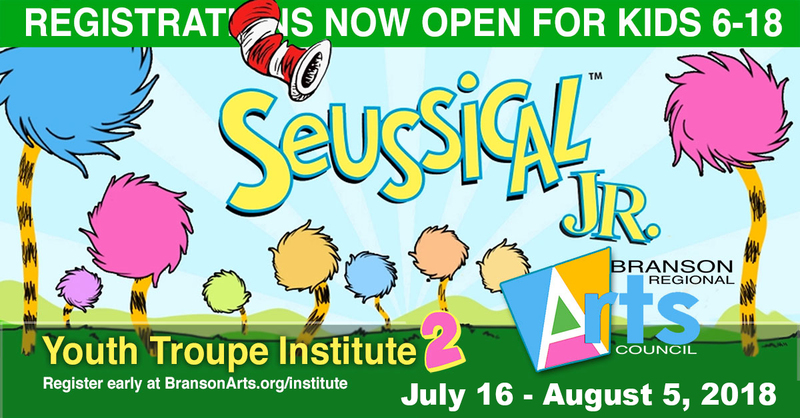 The next program begins on July 16th and culminates with public performances of Seussical Jr. from August 2nd – 5th at the Historic Owen Theatre in downtown Branson. There are no auditions to participate, just a registration fee to help cover a small portion of the expenses involved in producing a community theatre show of this quality. A professional team of Producers, Directors, Technicians and trained volunteers work with the children in a safe, and nurturing environment in order for these young actors to enjoy the best experience possible, while they grow and develop their social and interpersonal skills through the performing arts. Additional information and registration for Youth Troupe Institute 2 can be found at BransonArts.org/institute. Performing opportunities for Tri-Lakes Area Youth will hit hit a high note, as auditions for the new Youth, Concert and Show Choirs commence on August 17 and 18. Interested parties are encouraged to sign up for an audition slot, in advance, to secure their chance to participate. BRAC’s Youth Choir is a fun, beginning choir intended to introduce students to the importance of music theory, vocal warm up, stage: etiquette, presence & showmanship, and l-2 part choral parts. Although the Youth Choir is a beginning level group, the leadership and training will be both outstanding and demanding. Auditions for participation are not required, but students will need to sing in small groups (2-3 students) to determine vocal range for section assignment. Youth Choir Performances will include: Fall Concert, Winter Showcase & Spring Concert. Additional community performances may be added throughout the year. Watch for upcoming information regarding registration for this exciting new program. at rehearsal will be run in a serious “conservatory master class” style meaning from the moment the students enter the theater until they leave the theatre training is in process. The director will lead incredibly intensive rehearsals that will result in mind-blowing results and outstanding performances. Auditions are required to be considered for the Concert Choir. Students chosen to participate will gain invaluable vocal training, meaningful friendships and treasured memories for a lifetime. Concert Choir Performances will include: Fall Concert, Winter Showcase & Spring Concert. Additional community performances may be added throughout the year. BRAC’s Show Choir is an energetic advanced musical group intended to combine challenging music repertoire with entertaining choreography. The choir will focus on elevating and applying its formal training into lively, breath taking “show” style performances. Students will study advanced music theory, vocal warm up, stage etiquette, presence & showmanship and multi-part choral music. The leadership will be both demanding & rewarding. The director will lead incredibly intensive rehearsals that will result in mind-blowing results and outstanding performances. Students chosen to participate in this choir will gain invaluable vocal training, meaningful friendships and treasured memories for a lifetime. Participation in the choir is at the sole discretion of the director. 1-3 years music/choir participation required for consideration. 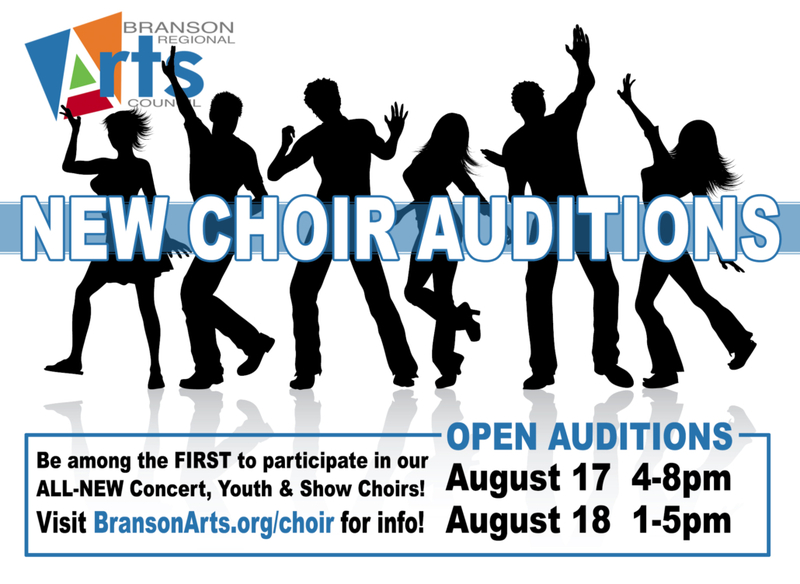 Students participating in Show Choir will be expected to also participate in Concert Choir. Show Choir rehearsals will be held immediately following Concert Choir rehearsal. Show Choir Performances will include: Fall Concert, Winter Showcase & Spring Concert. Additional community performances may be added throughout the year.